Oxalic acid is naturally found in some foods. Oxalic acid combines with metals such as calcium in the body to form oxalate crystals which can irritate the gut and kidneys. The most common kind of kidney stone is made of calcium oxalate. Since oxalic acid binds vital nutrients such as calcium, long–term consumption of foods high in oxalic acid can lead to nutrient deficiencies. Healthy individuals can safely consume such foods in moderation, but those with kidney disorders, gout, osteoporosis or rheumatoid arthritis are typically advised to avoid foods high in oxalic acid or oxalates. Oxalic acid requires exercise for it to be metabolized. If you get too much oxalic acid, then your body will begin to actually loose nutrients. If you or your family history indicates there is an increased risk of experiencing such health problems as mentioned above, then avoid juicing vegetables and fruits that are high in oxalic acid. Even if there is no history or cause to be concerned about kidney stones, gout, osteoporosis or rheumatoid arthritis, you should still only juice vegetables and fruits that are high in oxalic acid only occasionally and in smaller amounts. In the case of rhubarb the only edible portion is the stalk because the root and leaves contain dangerously high concentrations of oxalic acid. The gritty feel one gets in the mouth when drinking milk with rhubarb desserts is caused by precipitation of calcium oxalate. Thus even dilute amounts of oxalic acid can readily "crack" the casein found in various dairy products. Leaves of the tea plant (Camellia sinensis) are also known to contain among the greatest measured concentrations of oxalic acid relative to other plants. However the infusion beverage typically contains only low to moderate amounts of oxalic acid per serving, due to the small mass of leaves used for brewing. Oxalic acid and oxalates are mild nephrotoxic acids that are abundantly present in many plants, most notably fat hen (Lamb's quarters), rhubarb and sorrel. Oxalic acid irritates the lining of the gut when consumed, and can prove fatal in large doses. The LD50 for pure oxalic acid is predicted to be about 375 mg/kg body weight, or about 25 g for a 65 kg human. 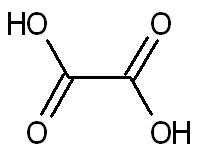 Oxalic acid can also be present in the body due to the consumption of another toxin, ethylene glycol (generally known as automobile antifreeze), because over time, the body metabolizes ethylene glycol into oxalic acid. Bodily oxalic acid may also be synthesized via the metabolism of either glyoxylic acid or unused ascorbic acid (vitamin C), which is a serious health consideration for long term megadosers of vitamin C supplements. Oxalic acid (IUPAC name: ethanedioic acid, formula H2C2O4) is a dicarboxylic acid with structure (HOOC)–(COOH). Because of the joining of two carboxyl groups, this is one of the strongest organic acids. It is also a reducing agent. The anions of oxalic acid as well as its salts and esters are known as oxalates. Since oxalic acid and calcium combine to create an indigestible compound, one should not juice oxalic rich foods and calcium rich foods together. An example would be spinach and broccoli. One should also avoid eating calcium rich foods immediately after juicing vegetables high in oxalic acid. This includes food items such as milk, seaweed, tofu, tahini (ground sesame seeds), etc. This table was originally published in Agriculture Handbook No. 8–11, Vegetables and Vegetable Products, 1984.